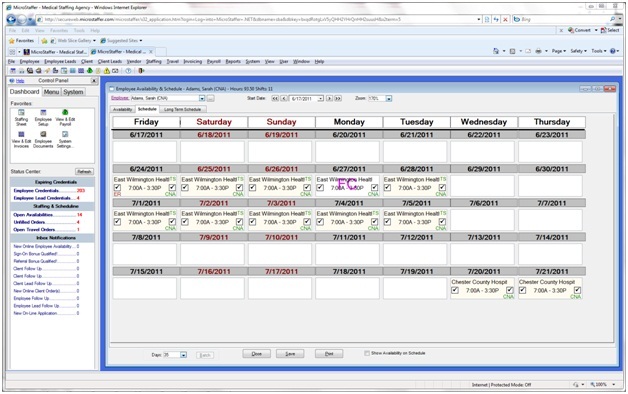 MicroStaffer allows you to view your employees schedule in calendar format, and offers you various ways to enter your staffing and scheduling information with seamless access to employee data and other related information. Choose from a variety of point-and-click Staffing Calendars and Browsers. Copying and pasting, drag-and-drop of scheduling. Copy entire schedules, e-mail confirmations and schedules. Instant skill and availability matching, seamless navigation. Open multiple schedules at one time, color coded shifts. Job finder windows match open orders to workers; fill shifts. Real-time ticklers warning you of expired information, scheduling conflicts and incompatibilities. Email and text messageing of scheduling changes and confirmations.